Sir Arthur Conan Doyle is the creator Sherlock Holmes, the best-known detective in literature and the embodiment of scientific thinking. Doyle himself was not a good example of rational personality: he believed in fairies and was interested in occultism. Sherlock Holmes stories have been translated into more than fifty languages, and made into plays, films, radio and television series, a musical comedy, a ballet, cartoons, comic books, and advertisement. By 1920 Doyle was one of the most highly paid writers in the world. Doyle was born on May 22, 1859 at Picardy Place, Edinburgh, as the son of Charles Altamont Doyle, a civil servant in the Edinburgh Office of Works, and Mary (Foley) Doyle. Both of Doyle’s parents were Roman Catholics. His father suffered from epilepsy and alcoholism and was eventually institutionalized. Charles Altamont died in an asylum in 1893. In the same year Doyle decided to finish permanently the adventures of his master detective. Because of financial problems, Doyle’s mother kept a boarding house. Dr. Tsukasa Kobayashi has suspected in an article, that Doyle’s mother had a long affair with Bryan Charles Waller, a lodger and a student of pathology, who had a deep impact to Conan Doyle. Doyle was educated in Jesuit schools. He studied at Edinburgh University and in 1884 he married Louise Hawkins. Doyle qualified as doctor in 1885. After graduation Doyle practiced medicine as an eye specialist at Southsea near Porsmouth in Hampshire until 1891 when he became a full time writer. First story about Holmes, A STUDY IN SCARLET, was published in 1887 in ‘Beeton Christmas Annual.’. The novel was written in three weeks in 1886. It introduced the detective and his associate and friend, Dr. Watson, and made famous Holmes’s address at Mrs. Hudson’s house, 221B Baker Street, London. Their major opponent was the malevolent Moriarty, the classic evil genius who was a kind of doppelgänger of Holmes. Also the beautiful opera singer Irene Adler caused much trouble to Holmes. In THE HOUND OF BASKERVILLES (1902) Doyle narrated an early case of the dead detective. The murder weapon in the story is an animal. He was knighted (“Sir Arthur”) in 1902 for his work in Boer War propaganda (particularly the pamphlet The War in South Africa: Its Cause and Conduct) — and, some said, because of the publication of THE HOUND OF BASKERVILLES. Owing to public demand Doyle resurrected his popular hero in The Empty House (1903). In these later stories Holmes stops using cocaine. Sherlock Holmes short stories were collected in five books. They first appeared in 1892 under the title THE ADVENTURES OF SHERLOCK HOLMES. The later were THE MEMOIRS OF SHERLOCK HOLMES (1894), THE RETURN OF SHERLOCK HOLMES (1904), HIS LAST BOW (1917), and THE CASEBOOK OF SHERLOCK HOLMES (1927). During the South African war (1899-1902) Doyle served for a few months as senior physician at a field hospital, and wrote THE WAR IN SOUTH AFRICA, in which he took the imperialistic view. In 1900 and 1906 he ran unsuccessfully for Parliament. Doyle was knighted in 1902. Fourteen months after his wife died, Conan Doyle married in 1907 his second wife, Jean Leckie. He dedicated himself in spiritualistic studies after the death of his son Kingsley from wounds incurred in World War I. An example of these is THE COMING OF FAIRIES, in which he supported the existence of “little people” and spent more than a million dollars on their cause. He also became president of several important spiritualist organizations. 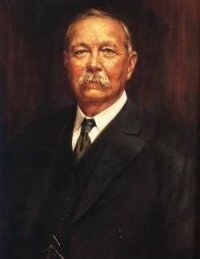 Conan Doyle’s other publications include plays, verse, memoirs, short stories, and several historical novels and supernatural and speculative fiction. His stories of Professor George Edward Challenger in THE LOST WORLD and other adventures blended science fact with fantastic romance, and were very popular. The model for the professor was William Rutherford, Doyle’s teacher from Edinburgh. Doyle’s practice, and other experiences, seven months in the Arctic as ship’s doctor on a whaler, and three on a steamer bound to the West Coast of Africa, provided material for his writings.